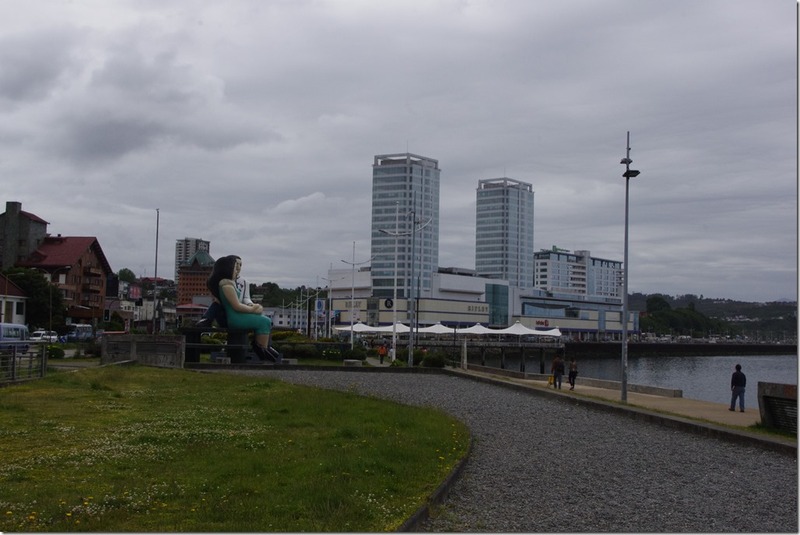 Puerto Montt is a large city at the northern fringe of Patagonia and at the start of the Carretera Austral. I’d come here primarily not for tourism but to do the mundane parts of long-duration travel (going to the bank, finding a laundrette and giving back my hire car), as well as it being the port from where my ship south will leave on Friday evening. 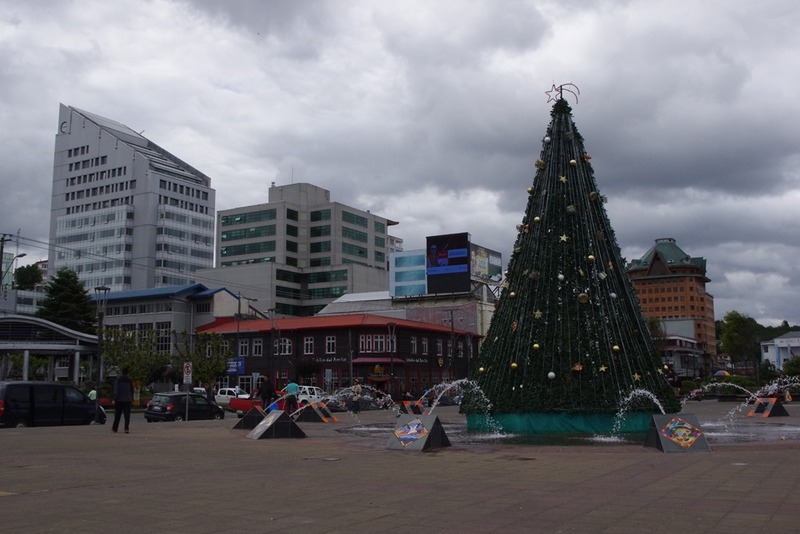 That said, central Puerto Montt turned out to be a remarkably efficient place and by 11am I was back in my hotel room, ready to explore the city a bit more. It’s a modern city with skyscrapers and a wide promenade along the seafront, where there’s also this slightly creepy statue of two giant lovers. It was also here that I was forced to face the fact that Christmas is coming soon. Generally Chile has been fairly free of things related to Christmas so far (they seemed to be concentrating on celebrating the Telethon at the end of November instead), and decorations were minimal. 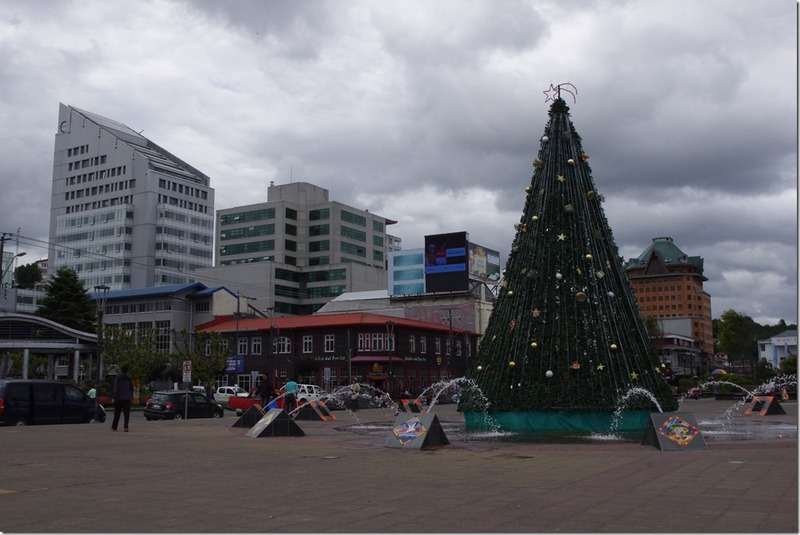 This was the first city I’ve seen thus far with a Christmas tree and I’m Dreaming of a White Christmas playing in the large shopping mall – rather odd when it’s 20c, muggy and the shops around are promoting the new season summer fashions! Tomorrow I have a lot of waiting around, by the sounds of it: I have to check in for the boat at about 9am, I get to board at 4pm, and we set sail for Puerto Natales at 8pm. The tracker at www.domsmith.co.uk/chile should continue to work while we’re at sea (obviously the Streetview version won’t) but this will be the last blog post for a few days, by which time I’ll be in Patagonia proper.